Do you know a everyday hero? One that doesn't think twice about doing something nice for others despite what it might cost to them? Angels Baseball is partnering with St. Joseph Health to recognize community heroes and their special moments through out Southern California! When I was approached to help spread the word about the good of others, I immediately thought of who did I know personally that is my own hero. I nominated my 6 year old son for being a community hero. He came home from his brand new school the second day and asked if he could bring his lunch box from Kindergarten to school. When I asked him why, I was told a little girl in his class didn't have a lunch box and that she brought her lunch in a cardboard box. He said she looked sad that she didn't have one and wanted to give her his. This is only one example of what a sweet and thoughtful child he is, I could name dozen instances! His small act of kindness might have led to a chain reaction of others giving selflessly! I am SO proud of him and encourage him in all his future endeavors. The St. Joseph Health Heroes campaign allows people to go to a special website where anyone can nominate a local hero by uploading a story and photo. The campaign encourages community members to share how people are making a difference in a moment, a day, or a life and provides an opportunity cheer on community members who are inspiring. Just for letting the community know about that outstanding individual, participants will be entered into a drawing to win an autographed baseball. In addition to St. Joseph Health Heroes, the Angels and St. Joseph Health are also offering a companion site called Halo Moments to share special moments in our lives that make us all unique, different and special. The site has received tremendous participation since its launch earlier this summer. 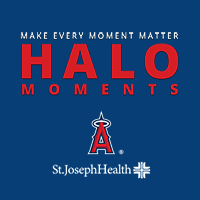 The St. Joseph Health Heroes and Halo Moments campaigns are part of a new three-year partnership between the Angels and St. Joseph Health, the Official Hospital Partner of Angels Baseball. Proctor said an overarching goal of the campaign is to spread awareness of the St. Joseph Health network and its hospitals in Southern California and the high quality health services provided to the community by encouraging fans and their friends and families to take small steps toward better health – together. St. Joseph Health (SJH) is a not-for-profit, integrated health care delivery system founded by the Sisters of St. Joseph of Orange. Today, SJH continues its work in the tradition of the Sisters through our wide networks of outstanding services. In each community it touches, SJH reaches out to care for the poor and vulnerable. In Southern California, these hospitals include St. Jude Medical Center in Fullerton, St. Joseph Hospital in Orange, Mission Hospital in Mission Viejo and Laguna Beach, St. Mary Medical Center in Apple Valley, affiliate partner Hoag Hospital in Newport Beach and Irvine as well as St. Joseph Heritage Heathcare, which includes four medical groups in Southern California. ENTER BELOW TO WIN A $15 TO THE ANGELS TEAM STORE! Giveaway open to U.S. Residence. No purchase necessary to enter. All fans have an equal chance to win, however, you must enter to win. A winner will be randomly selected via RaffleCopter and notified via email. No cash value. Winner will have 72 hours to claim their prize or a new winner will be selected the same way. Several different ways to earn entries (some can be done daily). Not liable for unclaimed prizes or fulfillment. Sponsor has the right to refuse filling prize for duplicate winners from other blogs. DISCLAIMER: I was given gift-cards to help spread the word of Halo Moments. All thoughts and ideas are my own. I was given permission to use the pictures in this post.